At Love That Door we pride ourselves on craftsmanship and customer service. To that end we want to ensure that your experience with our company is one that you will tell all your friends about. So when determining what wrought iron door to buy for your home, you should keep these things in mind. If it says "hand-forged", make sure it is. Hand forged wrought iron should use solid steel that is fired and then hand bent into shape. Beware of mass-produced or machine cut cheaper doors that typically use hollow material that looks the same.....but doesn't last the same. Insulation - A quality wrought iron door should be more than just decorative - it should provide insulation and help you save on your heating and cooling costs. Our doors are triple layer constructed using a polyurethane foam insulation and the finest glass panes with Q-Lon weather stripping. Not all coverings are created equal. Each of our doors is acid washed, sandblasted and hot zinc sprayed. After application of an epoxy primer and a black base coat, each door is hand painted with a surface color and clear-coated for long life. Cheaper coatings are far less durable and can actually crack or peel with temperature changes. Warranty - Be sure the company providing your door also backs your door. A quality door comes with a quality warranty. Ask what "Solid" means. 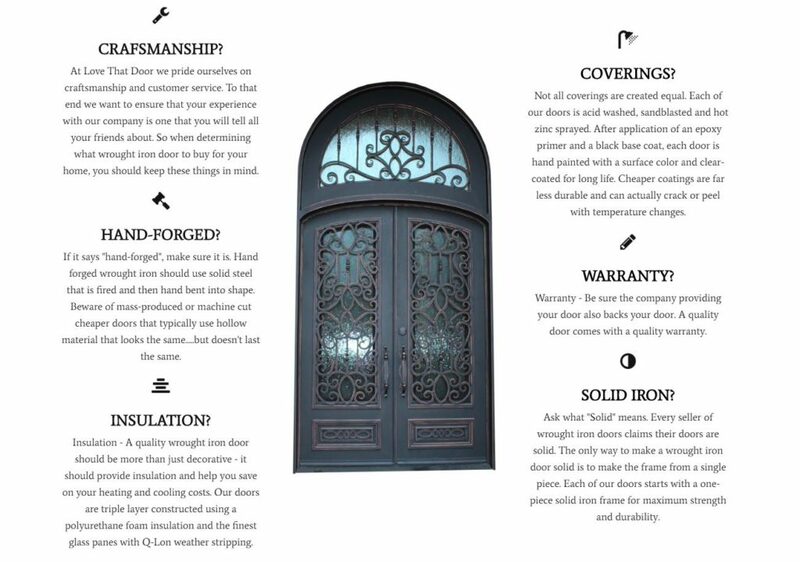 Every seller of wrought iron doors claims their doors are solid. 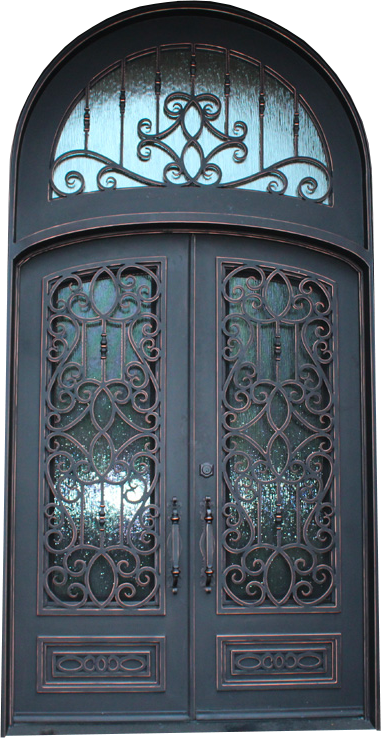 The only way to make a wrought iron door solid is to make the frame from a single piece. Each of our doors starts with a one-piece solid iron frame for maximum strength and durability. Love That Door has modernized the art of custom fabricated iron work, and the artistic ability to make YOUR DREAM COME TO LIFE! Click the link below to see some of our showroom doors and inspire your imagination. Keep in mind we have hundreds of doors available, or we can custom fabricate almost anything you can Imagine!